It continues to amaze me how our large-scale custom artificial trees completely transform a living space into lushspace – imbuing warmth, ambience and beauty with a single tree. Our large specimen trees are not only majestic, but incredibly lifelike – constructed by our experienced tree artisans, using specially cut hardwood trunks, using only the highest quality foliage. 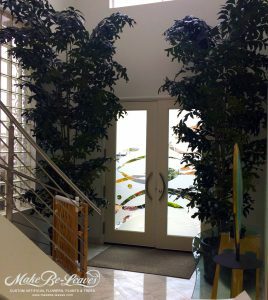 Make Be-Leaves worked closely with interior designer, Dale Blumenthal, of Design Work Place, in creating 12 ft. tall, slender faux Fishtail Palm trees to flank the interior multiple story-high entrance. Their client had real palms, which were not holding up well – even with good lighting. Now their client can enjoy these beautiful replica palms year-round – maintenance-free! 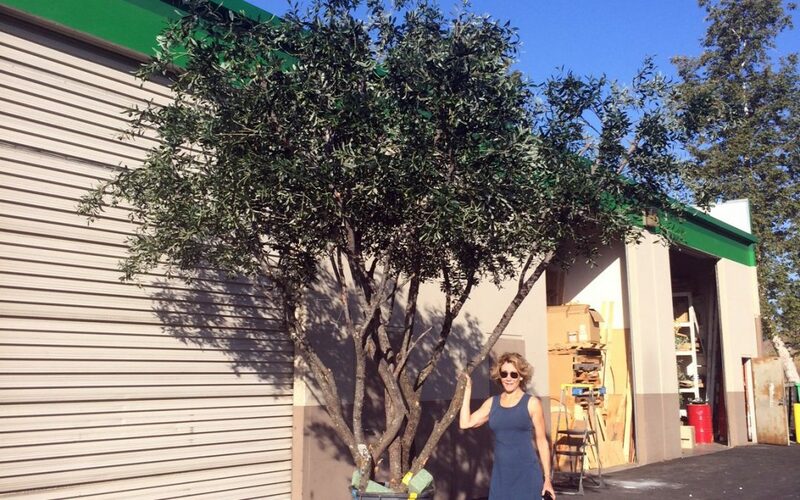 Make Be-Leaves has been contracted by Midici’s Neapolitan Pizza Restaurants to construct a large-scale artificial Mediterranean Olive Tree for their restaurants. The 14 ft. tall with 14 ft. full, round canopy will be the central, focal piece in each restaurant, with circular seating around the tree, bringing an authentic Italian feel, while customers dine under the tree. Our photo was taken at our facility prior to shipping to their Columbia, MO store – the tree base bucket will be hidden, set down into a recessed floor area at the job site. Make Be-Leaves has worked on a few projects with Premier Displays – for The Walking Dead set at the Comic-Con convention in San Diego. This year Make Be-Leaves constructed five large custom artificial Pine Trees, ranging in heights from 8 ft. up to 18 ft. tall! These Pine Trees are so realistic-looking! While we were in production, building these artificial pine trees in our facility, I flew to North Carolina to review a project there, and as I drove east from Raleigh on the highway, there were seemingly endless forests of pine trees – just like Make Be-Leaves’! Whether it is one custom focal tree that can create an intimate, inviting setting – or a grove of large-scale trees that can create a park-like setting in much larger atrium space – Make Be-Leaves’ large specimen trees will completely transform your project! Make Be-Leaves is a commercial supplier of artificial plants and trees, faux flowers, preserved palms, custom plantscapes and silk floral arrangements to the design trade. Make Be-Leaves works with landscape architects, interior and exterior designers to produce and install life-like custom plant creations worldwide. We are proudly recognized as a GSA-approved contractor since 1988, a WBENC-certified Woman Owned small business and California Certified Flame Treatment Applicator. Our plant creations are life-like and save you money.